The teenage girl who pushed her friend off a 60-foot bridge has been offered a plea deal, according to her attorney. 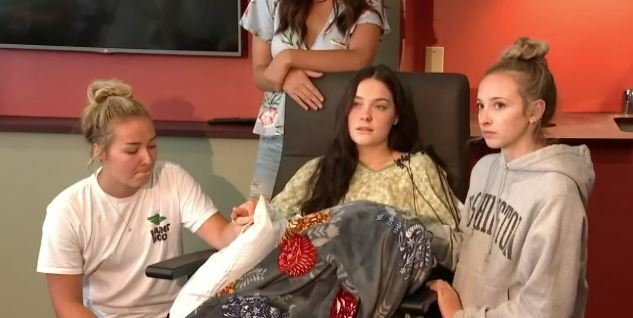 In a moment captured on viral video, Jordan Holgerson, 16, was pushed by her friend Taylor Smith off the Moulton Falls Bridge in Washington state last August. Holgerson broke six ribs and punctured both lungs when she landed chest first on the water below. Smith, who is now 19, faced charges of reckless endangerment and a possible maximum of one year behind bars. She previously entered a not-guilty plea. On Feb 11, her attorney announced the plea deal, reported the Columbian. Immediately after the incident, Holgerson just wanted “justice,” she told Today on Feb 12. However, now she is more eager to put the episode behind her. The video clip shows Holgerson hesitating on the edge of the bridge, having climbed over the railing, as Smith can be heard saying “I’m gonna push you,” off camera. A few seconds later, and two hands appear in shot and shove Smith’s shoulders, sending her out over the East Fork over the Lewis River, where she can be seen doing a painful belly-flop. “I went to the top of the bridge and my other—my friend … she came up to the bridge with me,” Holgerson told KATU from her hospital bed as she described the moments leading up to the push. Speaking on Feb. 12, Holgerson said she had mixed feelings about how she wanted her friend to be punished. “Certain days I kind of want her to be put in jail but some days I think that might be a little too harsh,” she said on Today. “So in court I was kind of hoping for justice and her being sentenced and everything just kind of being over because it’s been a long process,” Holgerson said. She said she didn’t immediately realize how much the injuries would affect her life. “I kind of got mad because the rest of my summer’s gone and I’m probably going to be recovering for the rest of the school year,” she said. Holgerson still suffers pain from her broken ribs. “Because ribs take so long to heal, every once in a while I’ll turn and they’ll pinch and hurt,” she said. Holgerson’s mom, Genelle Holgerson, said they know what the plea offer is, but she wasn’t sure if she could disclose it, reported the Columbian. “If this is what happens, we’re OK with the deal,” she said. Smith has said that she never intended to hurt her friend. The court case will continue on March 18th, when sentencing could take place if Smith accepts the plea bargain. If she doesn’t, then a trial will start.